Diane Kurys' Sagan is the latest in a series of biopic films that depict the lives of French cultural icons of the Twentieth Century. The trend that began with La Vie En Rose, continues with Sagan, and with the soon to be released Gainsbourg. The question is, who will it be next; Jean-Paul Sartre, Simone de Beauvoir, Jean Gabin or, perhaps, Jacques Tati? Novelist, playwright, and screenwriter Francoise Sagan, born Francoise Quoirez, was a literary genius whose dispassionate portrayals of bored, amoral middle-class people have been translated into many languages. In 1954, at the age of 19, she was catapulted to international fame with the release her critically acclaimed first novel, Bonjour Tristesse (Hello Sadness). Sagan would later write the screenplay for a 1958 film by the same title, directed by Otto Preminger, and starring Deborah Kerr, David Niven, and the ill fated Jean Seberg. Sagan would soon be travelling to the United States, where she was befriended by such luminaries as novelist Truman Capote and actress Ava Gardner. Almost all geniuses have a self-destructive streak, and Sagan of course, was no exception. Soon after her new found celebrity status, she would embark on a long, slow and often painful journey of self-destruction. Her legendary gambling, wild parties, alcohol and drug abuse, would scandalise France, and set tongues wagging for decades. She would crash sports cars as soon as she bought them, and would leave a trail of shattered lives and lovers in her wake. Not surprisingly, she was beset by poor health for the last twenty years of her life. To make matters worse, the French Tax department was pursuing Sagan for millions of unpaid tax money. The year is 1954, and Sagan (Sylvie Testud) has just finished writing Bonjour Tristesse. It's an overnight sensation, both in France and around the world, and particularly in the United States. There were of course, book-signing functions that followed, lots of them. At one such event, she mistakes Sartre protege, and journalist turned novelist Bernard Frank (Lionel Abelanski) for a parking valet. At another such event, this time in New York City, she meets her future husband, Guy Schoeller (Denis Podalydes). On her return to France, she famously crashes her new Aston Martin, almost getting herself killed in the process. She survives the accident, and as promised, Schoeller marries her. The marriage is not a happy one, and would soon end in divorce. This would then be followed by numerous affairs with both men and women, and her subsequent descent into self-destruction. 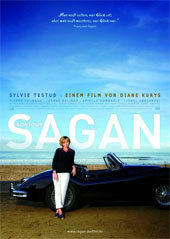 Sagan is brilliantly portrayed by Sylvie Testud. She provides is sensitive, at times moving, and totally unpretentious performance. The fact that she bears remarkable physical resemblance to Sagan is an added bonus. Testud has had a very busy couple of years after appearing as Momone in La Vie En Rose (2007), appearing in 12 productions during that time. Sagan has a first-class support cast that reads like a who's who list of some the most talented actors in France. These include Pierre Palmade as Jacques Chazot, one of France's most famous theatrical comedians and Sagan's life-long friend, Lionel Abelanski as novelist Bernard Frank, another of Sagan's lifelong friends, and Jeanne Balibar is remarkable as fashion designer Peggy Roach, and Sagan's one true love. Margot Abascal appears briefly as Florence Malraux, daughter of Charles de Gaulle's legendary minister for culture Andre Malraux. Veteran Arielle Dombasle provides a standout performance as the mysterious and scheming Astrid. This is a thoroughly enjoyable film that truly captures the essence of Sagan and her times. Director Diane Kurys has done a remarkable job - bravo.